GoldenEye 007 was released one year ago for the Wii, on November 2, 2010. When the game released it had a MSRP of $49.99, but has since seen a price drop and can be found for under $30. GoldenEye 007 received a "Teen" rating from the ESRB with "Blood, Mild Language, Mild Suggestive Themes, Violence" listed as content for parents/gamers to be aware of. How many hours have Wii owners spent covertly taking out enemies, and each other, in GoldenEye 007 over the last year? Let's take a look! 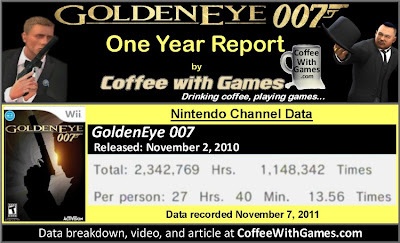 When GoldenEye 007's game-play data debuted on the Nintendo Channel last year, the game had about 6,579 Wii owners reporting their play-time with the game. GoldenEye 007 now has 84,685 Wii owners that have reported game-play data in the last year, with 370 days possibly reported. The game's average play-time per day/session reported is now 2 Hours 2 Minutes, which is lower than the game's debut play-time of 2 Hours 32 Minutes per day/session reported. GoldenEye 007 has a "professional" review score average of 83.77%, based on 62 reviews from GameRankings.com, and the game has a customer review score average of 76.66% based on just the 120 software only version reviews for the game(not including the Golden Classic Controller Pro bundle reviews). I purchased GoldenEye 007 the day it released last year, and I have enjoyed my time with the game's single-player campaign and my time with the game's online multi-player as well. I am currently making my way back through the game's single-player campaign slowly but surely, on a harder difficulty setting; but I probably won't touch the game again for a little while. GoldenEye 007's multi-player was fun for me and I enjoyed the different modes the game offered, but my issue with the game's multi-player was that once I hit around level 20, leveling up starts taking a very, very, very, very long-time. When Activision and Nintendo announced GoldenEye 007 for the Wii in 2010, many people wondered if the game could be released on the PlayStation 3 and Xbox 360. Many arguments I read said the game could not be released on those consoles because Nintendo owned the rights to the original GoldenEye game license. I wrote an article last November titled, "Can GoldenEye 007(Wii) Legally be Ported to the Xbox 360 and PS3? ", and I gave reasons why I thought the game could/would be ported. If you don't know, GoldenEye 007 has been ported to the PlayStation 3 and Xbox 360 and was released just last week on those consoles, and is titled GoldenEye 007: Reloaded. How many hours of game-play can PS3 and Xbox 360 owners expect from GoldenEye 007: Reloaded? Well, if Eurocom fixed the game's online multi-player's leveling up system, I would say the PS3 and 360 owners can easily expect to play the game more than 30 hours, as I put almost 100 hours of game-play in and didn't even get half-way leveled up in the multi-player. As for the Wii version's reported game-play hours, I think the game has seen success in both the "Total Hours" reported and the number of Wii owners reporting data, especially when compared to many other third party Wii games that have not even debuted yet. If any of you are wondering, "Coffee, would you still recommend GoldenEye 007?" I can say that I would still recommend it, even if only for the game's single-player campaign. While I'm not sure how active the Wii's online community is still with the game, I would say if you can find the game for around $20 now, to give it a try. Have any of you purchased/played the PS3 or Xbox 360 version of GoldenEye 007: Reloaded? If so, what do you think of the game? If you own the Wii version of GoldenEye 007, are you still playing the game's online multi-player? @Chalgyr: just gotta plug through my current backlog first. "@Chalgyr: just gotta plug through my current backlog first. What's that, another good weekend or two? lol"
Ahahahahah! Can't wait to see the list of games for November. It will be 50 long, and all completed 100%...and then we will KNOW he plays video games at work! @Coffee - I think I asked you before but is the PS3 and 360 version the exact same thing that you know of? 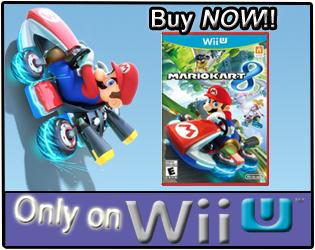 Yea, the PS3 and 360 version are the Wii version ported up/over to those systems. 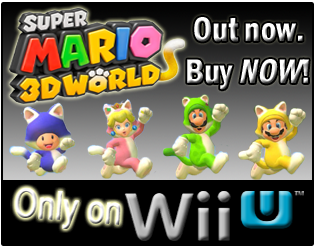 They added a few new modes to it, but the game/levels are the same as the Wii version. So, the game is not the N64 version you are looking for. Always an excuse, and trying to explain it away. We are on to your games(both literally and metaphorically). You work for a testing company, and don't want us to know about it...keeping the goods for yourself!